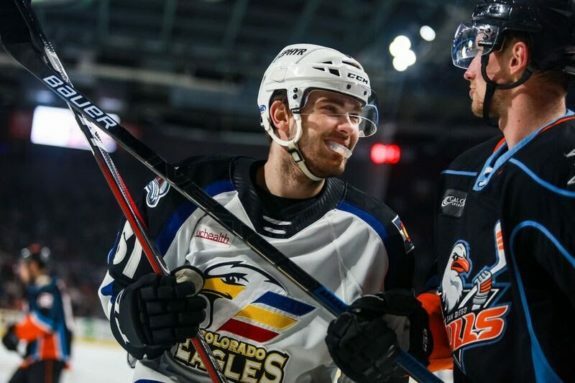 The Colorado Eagles, the first-year AHL club and back-to-back ECHL champions, served up some interesting hockey Friday night as they took on the San Diego Gulls in Loveland. 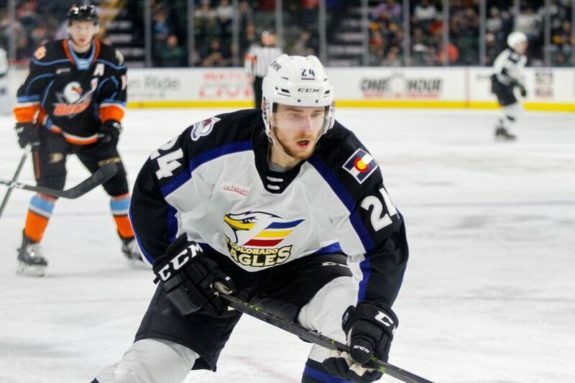 The Colorado Avalanche affiliate showcased a lot of young talent mixed with a fair balance of veteran players. The Eagles sit in the middle of the Pacific Division pack. They are three points behind the division-leading San Jose Barracuda but have played three more games. The Eagles hired a new head coach – Greg Cronin – as they moved up to the AHL. However, most of the Eagles’ ECHL staff moved up with the club. For example, their former ECHL head coach, Aaron Schneekloth, now serves as an assistant coach. 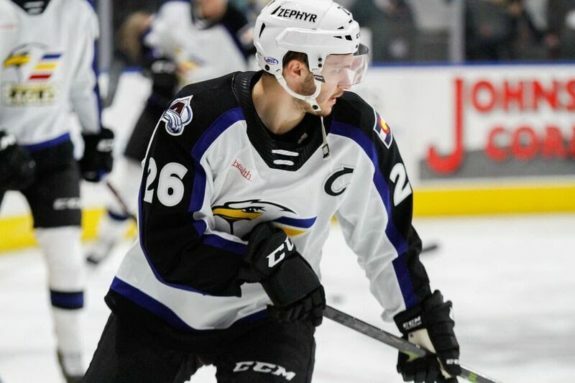 The Eagles were hosting the Gulls for the first of two games at the Budweiser Event Center. The arena appeared to be 80% full. Not bad for a Friday night. The opening ceremonies included a number of little kids, all decked out in their hockey gear, joining the players on the ice. 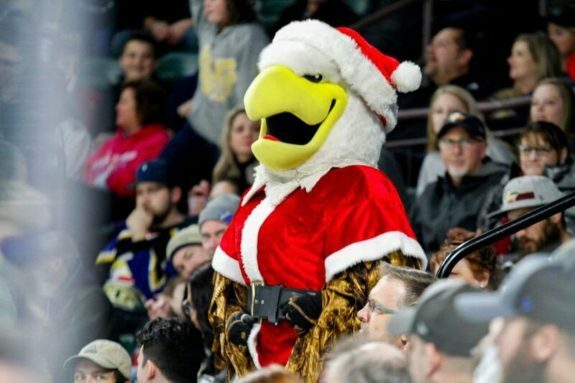 The Eagles mascot circled through the crowd, wearing a Santa outfit, greeting fans, shaking hands and encouraging cheers. He traveled through the sections to warm up the crowd, climbing to the middle of rows and warming up the pre-game crowd. The first period consisted of a lot of back and forth hockey with very little scoring. Actually, there was NO scoring. While the Eagles drew a power play opportunity near the end of the period, they failed to capitalize on the man advantage. The second power-play unit – stocked with a lot of young potential NHL talent – looked more effective than the first group. They were able to sustain pressure and stay in their structure but they also seemed reluctant to shoot. The second unit seemed to run a similar formation to the Avalanche. The defenseman (in this case Ryan Graves) quarterbacked the play near the blueline while Martin Kaut played the rear forward position against the left wall, distributing the puck to either one of the open forwards (Igor Shvyrev, A.J. Greer and Logan O’Connor) or sending it back to the point man. Throughout the entire power play, it was hard to suppress the urge to yell ‘shoot!’. There were a fair number of Gulls fans at the game. Perhaps the return of former DU Pioneer (now Anaheim Ducks prospect and Gulls player) Troy Terry drew the vocal following. Or maybe their team has a lot of fans in Colorado. Either way, it was oddly reminiscent of Chicago Blackhawks fans at the Pepsi Can. They cheered their Gulls and did their best to disrupt the Eagles fans. The Eagles faithful responded with cheers of their own as they waved their red pom-poms. The festive atmosphere sustained carried throughout the night. The second period saw more penalties and two-minutes of 4-on-4 hockey. Neither team capitalized. 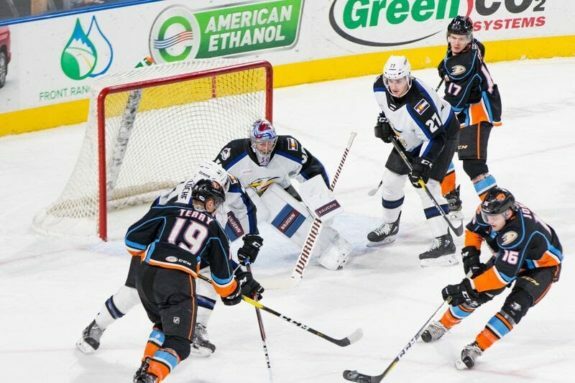 Goaltender Pavel Francouz came up big, making a couple of great saves as Gulls challenged the crease in a flurry of bodies crashing the net and fighting for the puck. Avalanche prospects Greer and Dominic Toninato played solidly on the penalty kill, breaking out of their own zone, skating the puck into the Gulls zone and then keeping it there for precious seconds as the clock ticked down. Kaut played on a line with veteran Andrew Agozzino and fellow rookie O’Connor. While their line had a few good moments, they looked out of sync for most of the night. Kaut and Agozzino seemed to struggle connecting although Agozzino managed some good individual moments. Shortly after the successful penalty kill, Agozzino managed to get a breakaway chance only to be denied in the finish. The Eagles’ Scott Kosmachuk was enough of a nuisance to the Troy Terry line that eventually one of Terry’s linemates lost their cool and knocked him down, putting the Eagles up on another power play in the last minute of the period. For all their work, the period ended without either team scoring. During a break in the action, the arena showed a clip from Happy Gilmore on the scoreboard, with Adam Sandler trying to golf with a hockey stick. The fans cheered and then started singing with the music playing in the arena. They were having a good time even though the contest had yet to see a goal. At the intermission, Eagles fans expressed concerns about the lack of scoring. A trio in the elevator complained about the absence of fights and scoring, considering both equally entertaining. Another fan at the concessions commented about the team’s struggle on the power play. Yet all the people were friendly and upbeat, even in their grumbling. The third period started out with veteran players and Ty Lewis finishing off an entirely unsatisfying power play which led to very few actual shots on net. However, the Eagles fans, sensing a lull, started chanting “Let’s go Eagles!” and filled the arena with the sounds of cowbells ringing. Yes, cowbells. Christopher Walken and Will Ferrell would have been proud. Shortly after another fruitless Eagle power play, a collision in the Eagles defensive zone led to skaters falling all over the ice, trying to jump over other fallen skaters only to land sprawling themselves. It was an unusual display of skill colliding with misfortune. At one point, O’Connor was swarmed by imposing Gulls players in front of the Gulls nets. Kaut, who was outside the scrum, took notice and moved right into the milieu, pushing players aside to get next to his teammate. It offered an interesting peek into the camaraderie the Eagles’ are building. 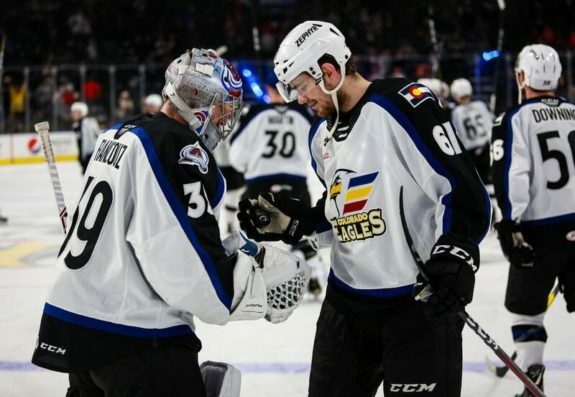 Shortly thereafter, the Eagles finally scored as Shvyrev and Anton Lindholm battled before the net to knock the unsecured puck out of the rival goaltender’s grasp and Travis Barron put it home. With a little over 10 minutes remaining, someone had finally scored. And it was an Eagle. Less than a minute later, Lewis got called for holding and the Eagles went on the penalty kill. And this is where something special happened. Greer, who played a lot of special teams minutes, took the puck down to the Gulls’ zone and kept possession for over 20 seconds. On his own. It was a veteran play that showed Greer had both the wisdom and the ability to hold the puck and run down the clock. After a line change, Travis Barron ended up going to the box and the Gulls had 18 seconds of 5-on-3 play. As Agozzino, Graves and Lindholm tried to clog the defensive zone, Francouz again came up big, making a huge save as Lewis skated back onto the ice. The Eagles managed to shutout the Gulls while playing 3:42 of short-handed ice time. The tide was turning and the crowd could feel it. Cheerleaders behind the glass danced with red pompoms on a platform. The sound of ringing cowbells increased. A smattering of Gulls’ fans tried to cheer their team on as the clock ticked down only to be overpowered by the Eagles chants. The Gulls pulled their goalie in a last-ditch effort to tie up the game. With 28 seconds remaining, Greer, near the Eagles’ net, managed to shoot the puck down the ice – GOAL! His unassisted tally sealed the win for the Eagles as the seconds counted down. The refs called a penalty on the Gulls in the waning seconds and the Eagles celebrated their sixth consecutive game with a point. Only this wasn’t just a point. This was a win. Recorded sounds of a horn blared as the Avalanche celebration goal song reverberated through the cheering crowd. The Eagles won 2-0. The undisputed star of the game – Francouz. 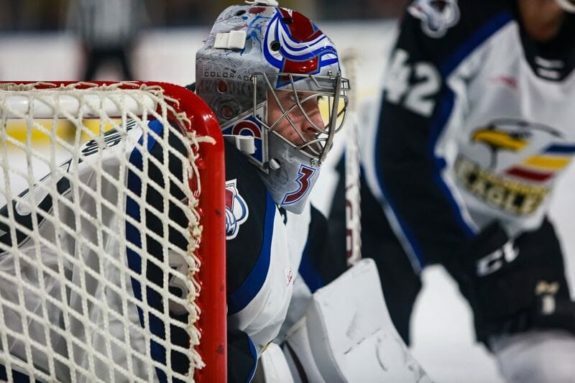 The Czech goaltender stopped all 29 shots for his first AHL shutout. Next up – the Gulls, again – for the Saturday matchup. As the cheerful sounds of the happy crowd drifted out the doors, the Eagles staff began to prepare for the next night. The Eagles had not only played a hockey game, they had put on a show. The show must go on.